TMS Marine Contractors have been repairing the sea wall at Trinity Pier in Plymouth over the past few months & look at the outcome. TMS started off by removing 7m x 12m of failed marina wall, we had to install a concrete slab underwater before reconstructing the wall in 500mm high sections and backfill behind the wall with type 1 stone, the wall has been rebuilt using perbeck walling stone & mass concrete backing. TMS then finished off by reinstating the concrete slabs, tarmac, fencing and installation of flap valves. TMS Marine Contractors are currently at Teignmouth Point car park, working hard to protect the town building new sea defences. The Piling has just been completed & this was carried out by our brand new Movax SG85 installing painted AZ26 piles. Following on from the piling will be a series of tie bars, wailing beams and an in-situ concrete capping beam. All of the works are heavily weather dependant and tidally constrained. 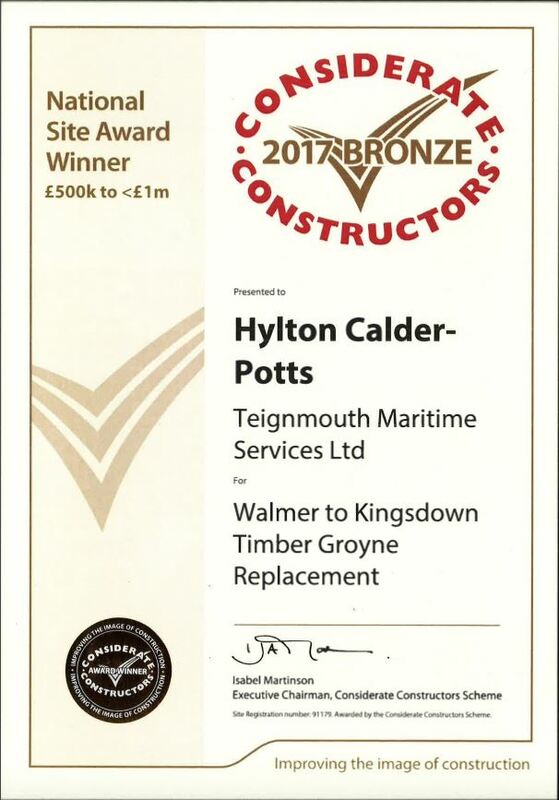 TMS are delighted that we have been awarded a prestigious bronze award from the Considerate Constructors Scheme, for the works completed at Walmer to Kingsdown, replacing timber groynes, planking and a slipway along a stretch of beach. TMS are always focusing on a good safe working site & to comply with the Considerate Constructors Scheme we need to, Care about the appearance of the site, respect the community, protect the environment, secure everyone’s safety and value our workforce. 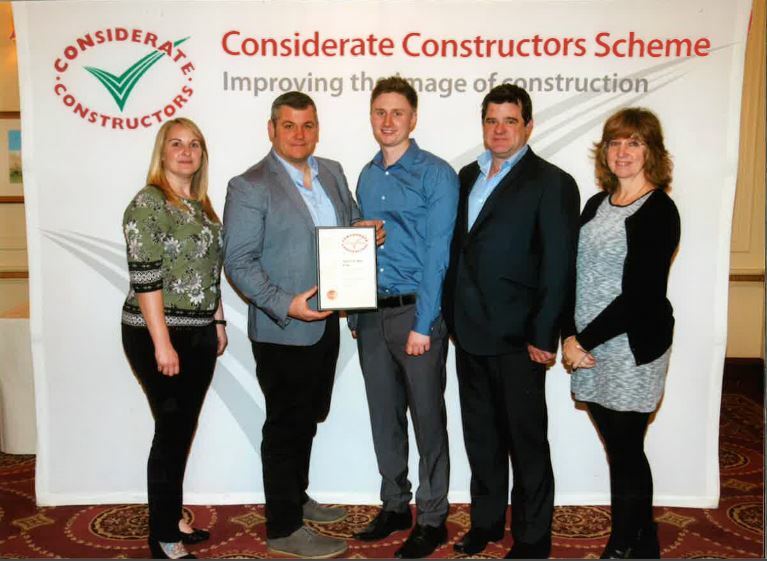 The Award was collected by Matt Castle our Site Engineer who helped deliver the scheme with Hylton Calder-Potts, Site Manager. We are very proud to be part of this scheme, and a big well done to everyone involved. 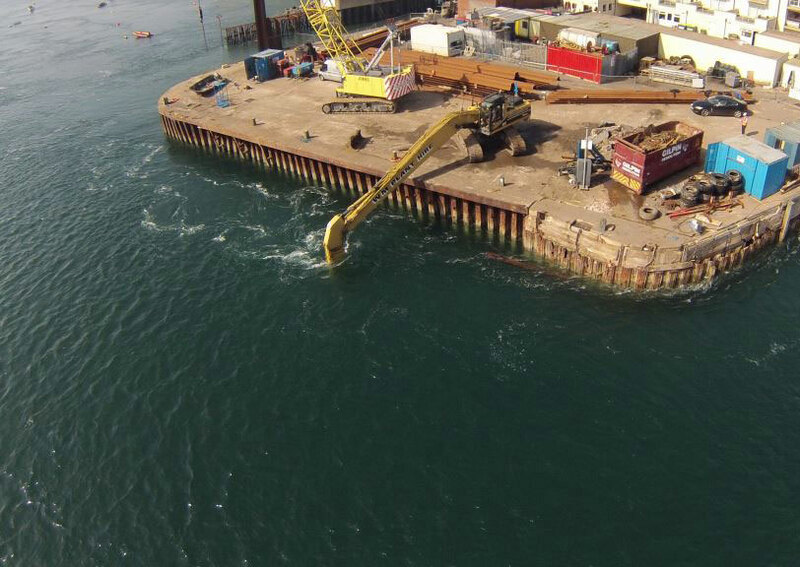 TMS Maritime are the principle marine contractor at Portland, pictured below is the last 28 tonne fender plate being installed on the OCP berth extension. 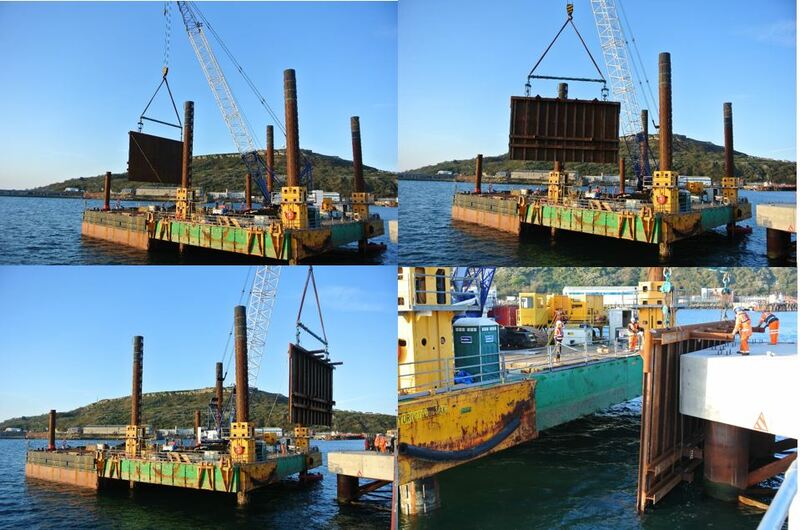 Video of Pile installation to follow.